Mrs. Billie Joyce Pomeroy, age 75, of Goodlettsville, TN; passed away peacefully on January 27, 2019. She was born on February 28, 1943 in Nashville, TN to the late William Jesse Barnes and Mildred Louise Coggins. Joyce adored her family and spending time with them. She was also an avid sports lover. You could always find her faithful companion, Max, by her side. 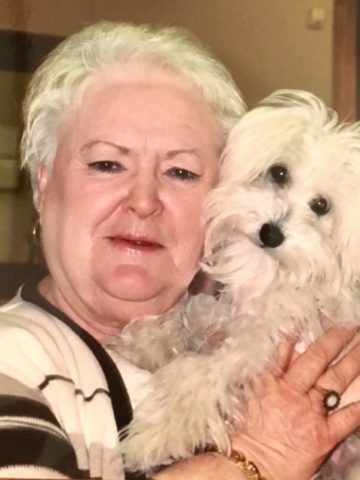 She loved all animals, especially cats and dogs. Joyce is survived by her children, Julie (Steve) Clark, Jeff (Tammy) Pomeroy, Jay (Dawn) Pomeroy; and three grandchildren, Taylor, Shelby, and Rachel. A life celebration will be at 2pm, Friday, February 1, 2019 in the chapel at Hendersonville Funeral Home. Family will receive friends from 5-8pm on Thursday, January 31, 2019 and again one hour prior to the service. Interment will follow in Hendersonville Memory Gardens. Joyce Pomeroy was such a seeet soul. She was kind and thoughtful. She will certainly be missed by all that knew here. I know that Jimmy will be waiting for her, anxious to walk through Heaven hand in hand as they did in life. First as a neighbor, school mate, although I was two years older, doubled dated, thru our marriages, secret shared. After she started losing memory, we held hands and danced to the music like teo kids, fishing and fun at lake house. I suppose what I remember most is the love she and Jimbo shared. They always put each other first. Jimmy would always say “let me talk to Billy Joyce and see would say better talk this over with Jimmy first. Loved them both.